Private baths with claw foot tubs. Each room in the main house is named after a local historic figure (click here to read our history). For the complete story, just ask us and we'll fill you in upon your visit!. Featuring a vibrant stained-glass window of his bear flag design, the Peter Storm room offers a mission-style bed, armoire, and a comfortable chair and ottoman. The private bath has a claw foot bathtub and shower. Gaze out the windows to views of vineyards, a walnut grove, and the Palisades Mountains. A secluded room on the first floor, the Lovina Graves room is furnished with a lovely Pinehurst queen bed and a settee that unfolds into a single bed. With views of the Palisades and the vineyard, this room has a large bath with claw foot tub and shower, and its own private, exterior entrance. Tucked into an upstairs corner, this quiet room is furnished with a queen sleigh bed, mahogany antiques and an oversized LazyBoy chair. Overlooking the swimming pool and garden, the John Cyrus room offers a private bath with claw foot tub and shower. Sunny and bright, this upstairs room offers views of the garden, swimming pool, and Mount St. Helena. The furnishings befit the era of this old farmhouse. It has its own detached, but private, bathroom across the hall, which includes a claw foot bathtub and shower. 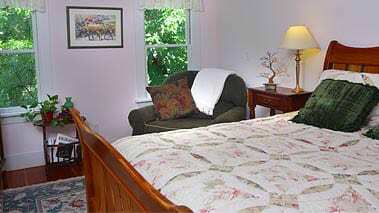 Located adjacent to the swimming pool, this private cottage offers plenty of space to spread out. 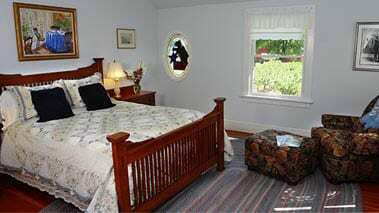 The bedroom features a queen bed, armoire, and a back door leading to a lovely and private heart-shaped patio. A spacious living room has a freestanding Buck stove, comfy chair and ottoman, and queen-size sofa bed. The bath has a claw foot bathtub and shower. 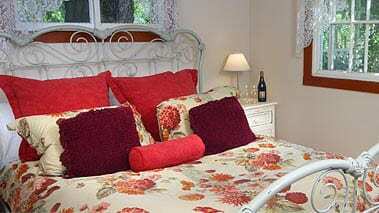 Cancellation Policy: If you cancel more than 5 days from the reservation date there is a $50.00 fee. If you cancel 5 days or less there is a charge of 50% of your total reservation.